Psst! I have a Society6 shop now!! One of the reasons I’m so proud of this piece is because the idea is autonomously my own (However unhealthy such a distinction that might be). 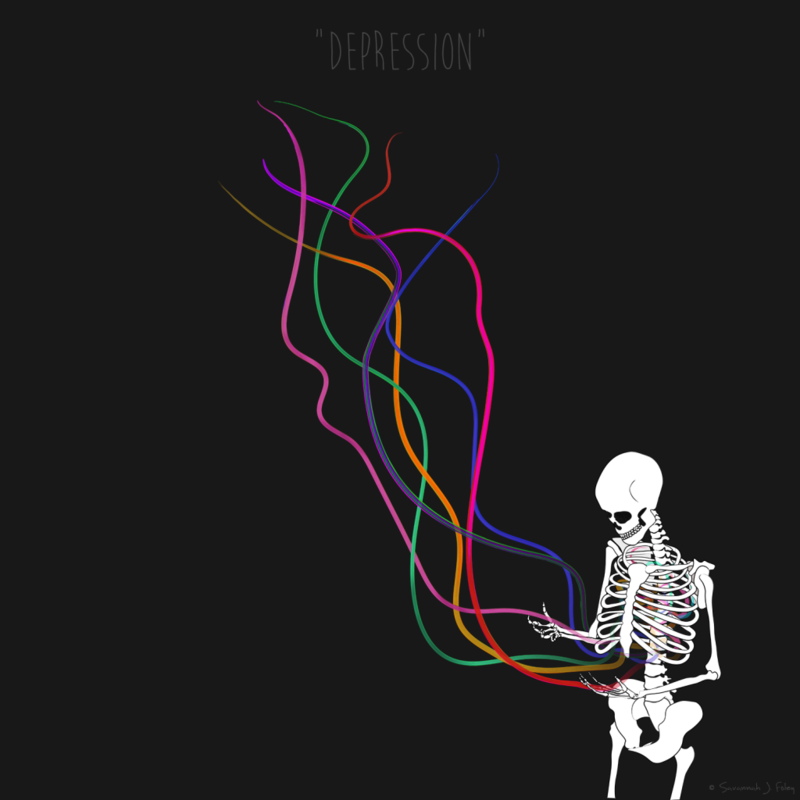 I pictured a skeleton watching colorful ribbons flowing out of its rib cage. The ribbons, of course, represented life and creativity. 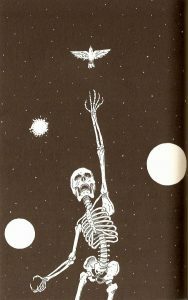 The skeleton could only watch helplessly as the ribbons flowed out of its grasp. I thought it would be beautiful and meaningful, but I didn’t know if I had the skills to make it happen. But I knew there was no way I’d actually make this on paper. I’m too unpracticed at paper drawings — I’d just get frustrated and quit. But my neurotic perfectionism would be at home in a computer program, where I could edit to my heart’s content. I set about trying to figure out a good way to replicate pen and ink drawings in Illustrator, but wasn’t very satisfied with the brush and texture offerings, even with third-party packs I downloaded. I even reached out to some artists who had illustrations like I wanted to create, but unfortunately for me they had all made their originals on real paper. Alas. I decided I could compromise on style, and move forward anyway. I really wanted to see this idea made real. I don’t know about you, but I can’t freehand draw a skeleton with no reference material (cue being unrealistically hard on myself). 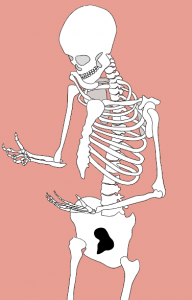 At first I tried to find a drawing where the skeleton was in the position I already needed, but quickly realized not only was that probably impossible, but would also give me that icky feeling of ‘copying,’ so I explored an alternative solution. 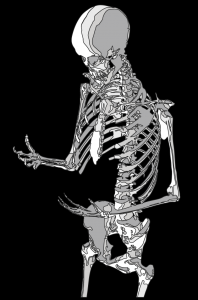 Surely there’s some sort of free skeleton modeling program online, I thought to myself. This tool was so amazing. 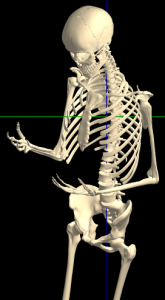 I modeled the skeleton to the pose I needed, and took screenshots to get a working base model. Theoretically one can use Illustrator to auto-create paths based on existing illustrations. This is incredibly useful for artists who make their work on paper, then want to upload them into Illustrator or Photoshop for edits. First I used a tool in Photoshop to reduce the image to 4 colors, inverted them so the highlights would look right, then lowered the saturation so it turned into a grayscale. I determined all the lines would have to be made freehand. I probably spent 4 or 5 hours just figuring out the best way to do this. I found the pen tool to be VERY frustrating until I gave in to its purpose and made each shape autonomous from the others. Blurgh. But it still wasn’t looking good. Eventually I realized it was because I was trying to recreate the weird shading shapes I’d made with the simplified skeleton, instead of honoring the true composition of the bones. 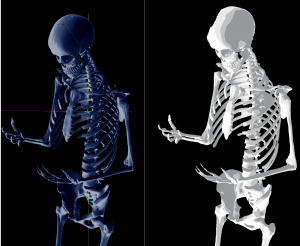 I referenced my Kineman model, spinning the skeleton around to get a good feel for what I was actually looking at. 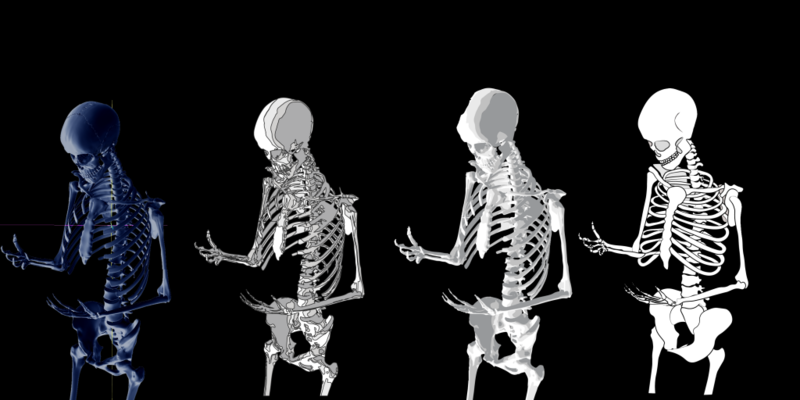 Then I began outlining each individual bone, using the Kineman screenshots as a placement model. As I got further into the project, I realized something wasn’t quite right. The Kineman model looked fine enough, but when I tried to represent it graphically the proportions were weird. The angle of some bones didn’t seem realistic, especially as they spanned from vertebrae to breastplate. Some ribs weren’t even connecting to the breastplate! By referencing the artwork of others, I learned that the ‘skeletons’ we perceive in art aren’t necessarily anatomically correct. 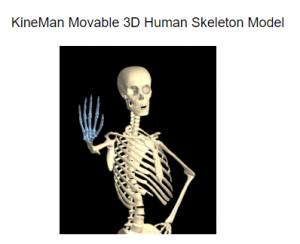 The Kineman model was showing me bones ONLY, not the cartilage that helped connect them and filled out our culture’s imagination of what a ‘skeleton’ looks like. I began to deviate more and more from the Kineman model, leaning into my instincts of what a ribcage ‘should’ look like from this particular angle. Layering is a process that continued through every part of the project, but became more important as time went on. Because many of the bones overlapped each other in odd ways, I had to be very specific with how my layers were organized. I had groups for main body parts, and sub-groups for each as well. The ribs were a particular challenge, and eventually I realized I’d have to do some final editing in Photoshop to get the layers right. I began to incorporate this plan into the art I was making, envisioning how I’d erase or adjust lines after the initial outline was finished in Illustrator. I tried to go about this the ‘real’ way, by making actual ribbons in both Illustrator and Photoshop. I watched multiple tutorials and practiced, but I wasn’t getting the effect I envisioned. Ultimately I decided to just stick with brushes. That gave me more control over the pattern of the ribbons, and it was very easy to adjust the look and colors. I learned some pretty cool tricks with this, such as adjusting the size of the stroke of the brush template itself (instead of the normal stroke guide), and learning how to mass-adjust color profiles. So cool! Another learning curve. I started by grabbing all the layers at once and importing them as pixels, but that got complicated when I tried to fix all those layering issues. 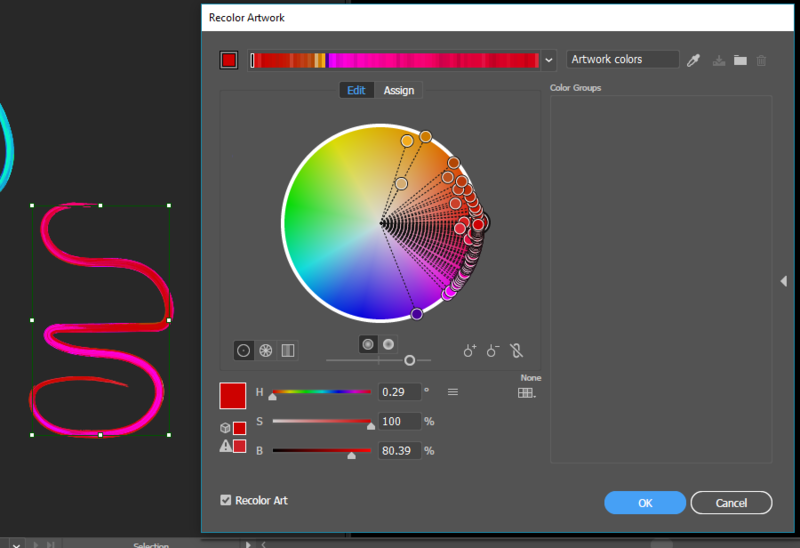 I started over, copying layers from Illustrator in discrete groups instead, to make it easier on myself. The ribbons came last, and I ended up importing them one-by-one. I erased overlapping lines and got all the skeleton bones looking right. I added in some shading to the skull. I really wanted to do some cross-hatching on the bones, but couldn’t make it look natural, like it would have with a pen drawing. Gave up on that for now. Maybe next time! The ribbons ended up being really complicated, and if I were to do it again I would put more planning into the ribbons before giving them final edits, as I just ended up making more work for myself. 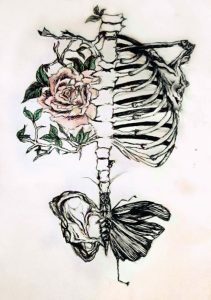 I didn’t pre-plan how the ribbons would exit the ribcage and entwine with each other, and trying to fix that in Photoshop was difficult. By erasing bits here and tweaking layers there, I got to a point where I was happy with how the ribbons looked. Now for the final step: transparency. My original idea was to imply the ribbons were leaving by making them more transparent in the rib cage. Adjusting the transparency of the ribbons as a group didn’t give me the effect I was looking for. I decided to add layer masks individually and adjust the transparency that way, to get a custom effect for each ribbon without affecting the others. Throw in some ‘burn’ effects to give depth, pick a font for title (and artist signature!) and……….. DONE!